Made with affection and artistry, this retro appetiser is a very pleasant surprise. Bloodstained: Curse of the Moon keeps the lifeblood of the Castlevania series pumping with a condensed, and appropriately retro homage. 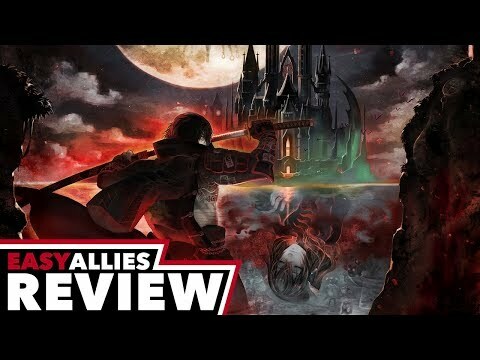 It might not blaze the trail on anything new like a few other recent Inti Creates projects have, but it does exactly what it needs to do, and helps bolster the new legacy of Bloodstained proper before it's even out. Bloodstained: Curse of the Moon is a good game to get started in games like Castlevania at an interesting price. Bloodstained: Curse Of The Moon is undoubtedly aimed at a very specific audience, and you'll know if you're part of that just by looking at the screenshots. If those, combined with words such as these, make your heart sing, however, it's definitely worth your time. It's like Castlevania just decided to come soaring back into all our lives, and how can that ever be a bad thing? Exactly. A great return of Koji Igarashi. Bloodstained: Curse of the Moon is an awesome tribute for the classic Castlevania games. Aside from the repetition, which is, in retrospect, how many gamers got longevity out of old Castlevania games, Bloodstained: Curse of the Moon is a superb game. It is ideal for gamers who want an old-school challenge as well as an old-school game in both aesthetic and design. Classicvanias and retro action games fans can give a chance to Bloodstained : Curse of the Moon on blind faith. This game is a beautiful, really enjoyable - even if it can considered a bit short - and vibrant tribute to Castlevania III : Dracula's Curse with some great action and platofrming, beautiful 8-Bit graphics and musics, in a new setting that we hope will fulfill ita potential with Ritual of the Night. Curse of the Moon is a nostalgic trip back to the era of classic Castlevania games, warts and all. The controls feel right, the challenge is satisfying, the presentation is nostalgic, and there are numerous reasons to keep returning to it. The night might be dark and full of terrors, but Curse of the Moon gives us some very effective tools to take down the evils that lurk within. As far as throwbacks go, Bloodstained: Curse of the Moon is a worthwhile venture. It captures the essence of yesteryear's classics, while offering numerous options to comfort an audience that might be unfamiliar with that time period. The game is also quite entertaining, and the replay-value is quite high. Still, it is not possible to shake the feeling that something is missing. It's as if the developer decided the safe choice was the right one, and left all of the risk-taking up to the player. Will this game be remembered in thirty years? Only time will tell. All that said, Curse of the Moon is a very enjoyable old-school Castlevania homage that's well worth the price of admission—as long as you have nostalgia for those games. Those of you who have no patience for the first three Castlevania games in particular may want to give Curse a wide berth, but I daresay there are systems in place here that may tickle your fancy. Bloodstained: Curse of the Moon brings back the essence of the 8-bit Castlevania games in a masterful way. The 8-bit graphics, the chiptune sound design, and the old-school gameplay harmoniously mix together to make a game that feels like it loaded straight off a cartridge. "Castlevania's spiritual successor by blood." Bloodstained: Curse of the Moon may be a prequel to Bloodstained: Ritual of the Night, but functions as a worthy homage to the NES Castlevania games.